Cloud is top of mind for enterprises today. Many organizations have been looking to incorporate the public cloud into their architecture for secondary data and apps. The reason why? Research shows public cloud is fast becoming a natural destination for use cases such as long-term retention (LTR) and disaster recovery (DR). 79% of enterprises said they are likely to move some legacy tape data to the cloud. 36% of enterprises expect disaster recovery to be the first to move to the cloud. Enterprises see a hybrid cloud environment – which seamlessly incorporates public cloud and on-premises – as being key to data center transformation. Data is recognized as one of the most valuable resources in digital transformation, but data silos and legacy solutions have made it difficult for organizations to protect or locate – let alone manage or exploit – their most important digital asset. They are eager to bring long-term retention and DR together under one roof! The public cloud is enabling agility and cost savings for enterprises, allowing them to develop applications at a much faster rate. However, this convenience comes at a price. 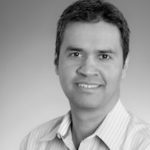 Enterprises are also starting to see silos emerge in the public cloud, which means they are simply mirroring the mass data fragmentation problem that was happening on-premises. Explosive data growth and accompanying mass data fragmentation has created a lack of visibility and control across these dual environments — it’s become impossible to know exactly what data is on the public cloud vs. what’s on-premises. Enterprises are asking themselves: How can I manage a hybrid environment with a single interface and common administrative tools vs. juggling multiple point solutions and data silos? As they contemplate a hybrid-cloud environment, enterprises struggle with a critical question: How do we ensure compatibility, data mobility, and application portability? Enterprises need the ability to easily spin up and spin down virtual machines (VMs) in order to speed up test/dev in the cloud while facilitating cloud migration. Backup from on-premises while also integrating public cloud storage infrastructure from Microsoft Azure, AWS, and Google Cloud. Long-term retention for archiving to the public cloud. Data mobility to facilitate efficient test and development. 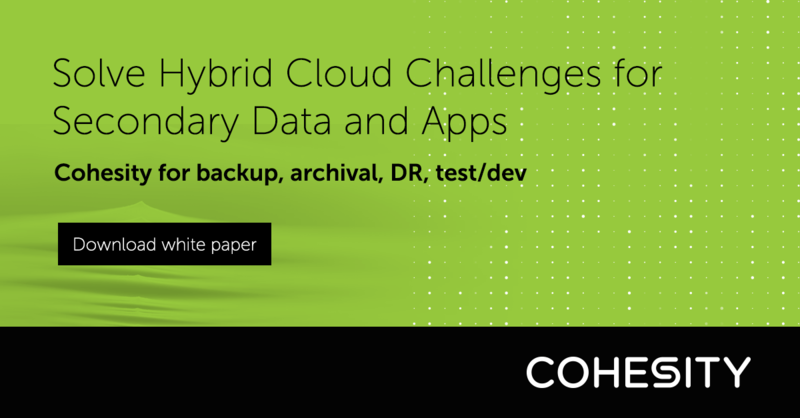 To learn more about these challenges and how Cohesity can help you address them, we encourage you to read our white paper, “Solve Hybrid Cloud Challenges for Secondary Data and Apps”.